Traditional WingsFresh jumbo wings cooked in trans fat-free oil and tossed in your choice of sauce or dry rub. Add celery, homemade ranch or blue cheese. 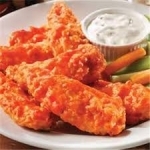 Boneless WingsFresh boneless wings cooked in trans fat-free oil and tossed in your choice of sauce or dry rub. Add celery, homemade ranch or blue cheese. Fresh TendersFresh Tenders cooked in trans fat-free oil and tossed in your choice of sauce or dry rub. Add celery, homemade ranch or blue cheese. Buffalo ShrimpLightly breaded shrimp fried or grilled and then drizzled with your choice of sauce. Buffalo Shrimp $6.25 Lightly breaded shrimp fried or grilled then drizzled with your choice of sauce. Loaded Nachos $9.99 Nacho chips covered with chili, cheese, jalapeños, olives, salsa and sour cream. Loaded Fries $9.99 Choose between our delicious Regular Cut Fries or Waffle Cut Fries, covered with chili, cheese, jalapeños, olives, salsa and sour cream. Loaded Tater Tots $9.25 Hot, deep fried Tater Tots covered with chili, cheese, jalapeños, olives, salsa and sour cream. Potato Skins $5.99 Four, delicious Potato Skins covered in melted jack cheddar cheese and bacon. Served with a side of sour cream. Mozzarella Sticks $5.99 Five mozzarella sticks served with a side of marinara sauce. Fried Pickkles $5.99 Five, beer-battered pickle spears. Served hot and fresh. Garlic Parm Sticks $6.49 Four, delicious garlic infused parmesean sticks, deep fried. Mini Corndogs $4.99 Five mini-corndogs served covered in melted nacho cheese or plain. BurgersThe BEST half-pound burgers in Stafford. Handcrafted with a delicious ground chuck served with lettuce, tomato, pickle and onion on a fresh baked bun. "Make-it-a-Combo" which includes a Side and a Soda of your choice. North Stafford Burger $7.99 Our 1/2 Pound burger topped with American Cheese, pickle and mayo OR your choice of one of our famous sauces. BBQ Bacon Cheeseburger $8.99 Our 1/2 Pound burger topped with fresh cooked bacon, slices of American Cheese, grilled onions, and your choice of one of our favorite sauces. Breakfast Burger $9.99 Our 1/2 Pound burger topped with a fried egg, bacon, grilled onions and mayo. SubsOrder just a Sub or "Make-it-a-Combo" which includes a Side and a Soda of your choice. Buffalo Style Chicken Sub $7.49 Served with boneless white-meat chicken. Lettuce, tomato, mayo, blue cheese and our special Buffalo Sauce. "Make-It-A-Combo" which includes a Small Side and a Soda of your choice. Chicken BLT Sub $7.49 Served with boneless, white chicken meat, bacon bits lettuce, tomato, mayo, and your choice of Sauce. Make it a combo which includes a Side and a Soda of your choice. Chicken Tender Sub $7.99 All white meat chicken tenders, lettuce, tomato and mayo. Make it a combo which includes a Side and a Soda of your choice. Cheesesteak Sub $8.99 Served with your choice of grilled chicken or grilled steak, provolone cheese, grilled onions, lettuce, onions and mayo. Make it a combo which includes a Side and a Soda of your choice. Catfish Sub $8.99 Our catfish served with lettuce, tomato and mayo. Make it a combo which includes a Side and a Soda of your choice. Side Salad $3.99 Choice of dressing. Fresh Cut Never Frozen Fries $2.99 Served with or without a Dry Rub Seasoning of your choice. Add optional Cheese or Bacon to garnish the fries! Waffle Fries $2.99 Served with or without a Dry Rub Seasoning of your choice. Add optional Cheese or Bacon to garnish the fries! Tornado Fries $4.25 We spiral cut a potato and fry it til it's golden brown - Like homemade chips only in a giant stack! Tater Tots $3.50 Deep fried and served piping hot. Garnish with optional Cheese or Bacon topping. Hush Puppies $2.99 Enjoy our local favorite in two sizes; 7 or 14 Piece. Buffalo Mac n' Cheese $6.99 Our all new Buffalo Mac 'n Cheese made from our popular Mac n' Cheese but now with spicy buffalo. SaladsMeal-sized salads prepared fresh daily. Served with your favorite dressing. Garden Salad $6.99 Romaine lettuce, tomato, onion, green peppers, shredded cheese and croutons. Grilled Chicken Salad $7.99 our Garden Salad served with fresh grilled chicken. Caesar Salad $6.99 Romaine lettuce, croutons, parmesan cheese and Caesar dressing. Add Grilled or Breaded Chicken. QuesadillasAll of our Quesadillas are served on a 12", flour tortilla, with salsa and sour cream. You can also "Make-it-a-Combo" which includes a Side and a Soda of your choice. BBQ Chicken Quesadilla $8.99 Comes with Chicken, BBQ Sauce and onions. Served with salsa and sour cream. You can also "Make-it-a-Combo" which includes a Side and a Soda of your choice. Buffalo Chicken Quesadilla $8.99 Served with salsa and sour cream. You can also "Make-it-a-Combo" which includes a Side and a Soda of your choice. Fiesta Chicken Quesadilla $8.99 Comes with Chicken, tomatoes, onions, peppers, black beans and corn. Served with salsa and sour cream. You can also "Make-it-a-Combo" which includes a Side and a Soda of your choice. Steak Quesadilla $8.99 Comes with steak and cheese. Served with salsa and sour cream. You can also "Make-it-a-Combo" which includes a Side and a Soda of your choice. WrapsYou can order just a WRAP or you can "Make-it-a-Combo" which includes a Side and a Soda of your choice. Chicken BLT Wrap $6.99 Grilled chicken, cheese, bacon, lettuce, tomato, mayo or your choice of sauce. You can also "Make-it-a-Combo" which includes a Side and a Soda of your choice. Chicken Caesar Wrap $6.99 Grilled chicken, romaine lettuce, parmesan cheese and Caesar dressing. You can also "Make-it-a-Combo" which includes a Side and a Soda of your choice. Buffalo Wrap $6.99 Crispy breaded chicken strips tossed in our Buffalo sauce and served with lettuce, tomato and blue cheese. You can also "Make-it-a-Combo" which includes a Side and a Soda of your choice. Fiesta Wrap $6.99 Grilled steak, onion, tomato, green pepper, black beans, corn, salsa and jalapeños. You can also "Make-it-a-Combo" which includes a Side and a Soda of your choice. Deep Fried Oreos $5.99 Eight Oreos, battered and deep fried. Deep Fried Twinkies $3.99 They're back! Two Twinkies battered then deep fried to perfection. Seafood PlattersAll of our Seafood Platters are served with fries, hushpuppies and coleslaw. Choice of cocktail or tartar sauce.